How long will it take to receive my fabric order? Our current turnaround time is about 20 days from the time that you place your order. We'll bring it down again to 4 as soon as we can get caught up. We anticipate bringing down the shipping times considerably by the end of August. 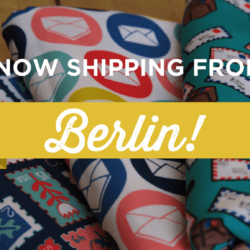 International Friends: Spoonflower is Now Shipping From Berlin! Is it still taking you 3 weeks to deliver fabrics? We are in UT and AZ. Hey. Yeah I’m in Sydney Australia and only recently planned to prepare for a Christmas present. Is it possible to get one week prior to Xmas? That should be ok, although international shipping is a bit unpredictable. You should order in the next day or so to be safe. 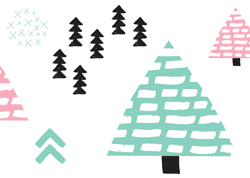 Hello – I just read about your site in Craft magazine. I just wanted to say how excited I am that you’ve offered this service! I’ll be planning my first order ASAP. hello. i ordered some fabrics on november 29th. when do you reckon i might be able to receive it? thanks. Hello, i’ve post my own design on 25, the fabric still processing, how long does i have to wait that you print the fabric and ship to me? take a month to be delivered. I hope that doesn’t happen in this case. This is such a great service! I’m wondering about delivery times to Toronto, Ontario. If I have the design sent to you by monday of next week (feb 16th) can I have it by March 1st? if you have a deadline. I live in Milwaukee, WI, US. I’m doing a school project, which I need the fabric within 1 to 2 weeks maximum, is that possible, I would pay more the the priority shipping and any other priority fee. Is that possible? just can’t do it at the moment. I’m sorry! Is it the order still take 3 weeks to receive the fabric? In your response to other customer, you said “In general we are printing and shipping orders within 10 days”. Is it true? if it is it would be great, . Hi i’m from México, i just really want to know how long will it take to receive my fabric order? What’s the current turn-around? The message is more than half a year old… and definitely not down to 4 days yet. Gila, we’re at an average turnaround of eight days at the moment. Should be back under five days again around the middle of October. you guys are getting the question alot, but, “what is your current turn around time?” as of October 4 2010? Thanks! Current turnaround is about 7 days right now. It is on its way down. Our wait time actually varies day by day depending on the order volume. When you place an order in your cart — and then again on the order confirmation email — you should see our current average turnaround time. For people ordering today, for example, the wait time to ship is averaging 10 days. I wish we could lock it down so that it was always the same, but we're just not there yet. I'm sorry!